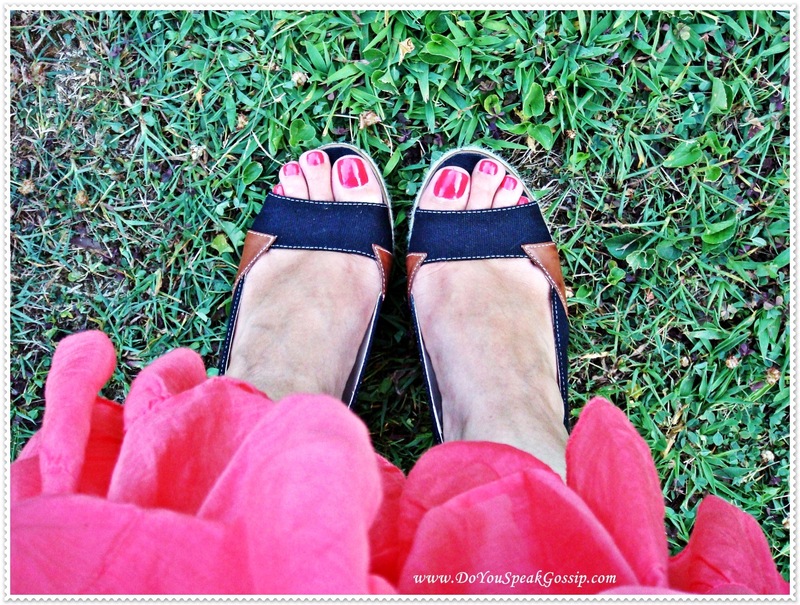 Coral Dreams - Do You Speak Gossip?Do You Speak Gossip? So, just to be completely honest, these pics are obviously from last week, when I still had this beautiful hairstyle on. Nothing special to attend this time, just a cup of coffee with some friends, at a local coffee shop to farewell my dear friend S, who was leaving for Switzerland the next day. 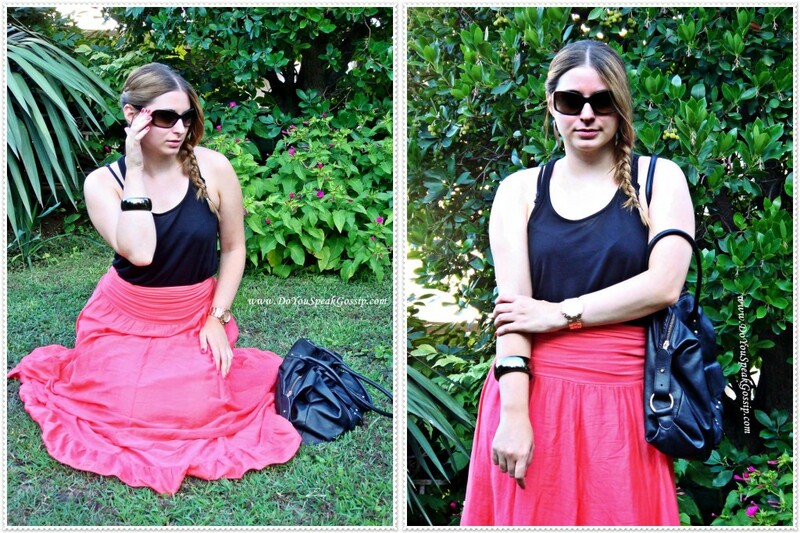 I channeled the inner gypsy in me once more, and went with my coral maxi skirt (to match my coral nails, hehe). I don’t think there’s anything you haven’t seen in this outfit, but I really liked it. Hope you like it too. 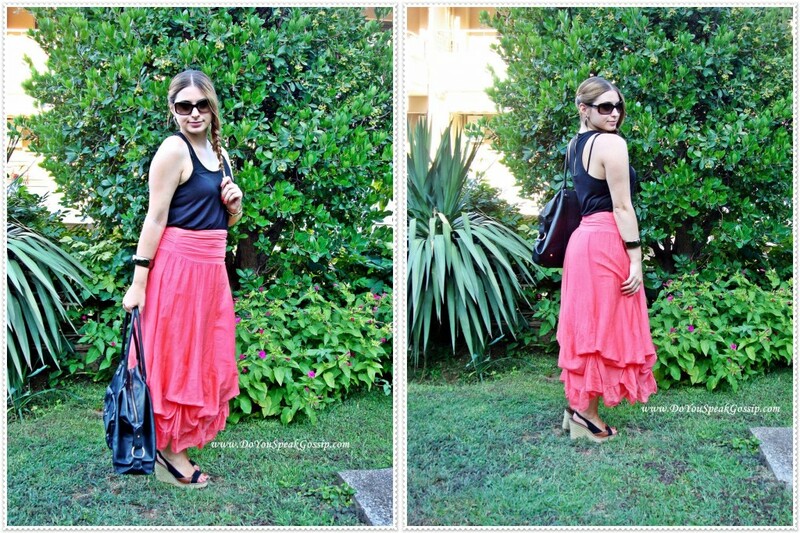 Wearing: Zara top, skirt from local store (Delight of Light), Bournazos wedges, Donna Karan sunglasses, Eleutheriou handmade earrings, Penny Black bag, Marella bracelet and Michael Kors rose gold watch. The braid was a bit messier than in my last outfit post, but I loved it anyway. I recently created a Lookbook account, you can find it here. I would really appreciate it if you could fan me or hype my look(s). More coming soon! Oh, and have you followed my blog yet? If you haven’t, please do. Claire recently posted..Happy Birthday to my boyfriend! To sygkekrimeno hairstyle sou paei teleia, to idio k h fousta. S’euxaristw poli Froso! Makari na mporousa na to kanw sinexeia auto to hairstyle, alla distixws den pianun ta xeria mou! S’euxaristw poli Chrysa mou! Fetos, kanw oti mporw gia na ta diatirw peripoiimena…palia den asxoliomouna katholou me ta nixia mou…Mallon ftaiei oti agorasa para polla vernikia auto to kalokairi, kai ithela na ta xrisimopoiisw ola! Kai egw prospathw na ta diatirw konta (oxi teleiws giati me anatrixiazoun) alla megalwnoun poli grigora, kai variemai kai trela na ta limarw…auto pou vlepeis pantws einai ligo pio makri ap ti vasi tou nixiou…Apla i vasi einai megali! Ama spane pantws, iparxune eidika vernikia gia na se voithisoune s’auto! S’euxaristw poli Nadia! Xairomai pou sou arese to outfit kai to blog mou! to korali einai latreia <3 gia xeimwna kalokairi kai as to orizoun san kalokairino xrwma! !egw tha t foraw olo t xrono! polu wraio to xrwma ths foustas k to kopsimo! (alla eidika to xrwma) k tairiazei teleia me ta nyxia sou!! Twra to mono mou problhma einai pws 8a paw sthn ekklhsia (o gamos einai sth Mitropolh) me tis poreies pou 8a exei!!!! mhn anhsuxeis gia to comment…den afhnei na ta dipla comments to wordpress…sou bgazei mhnuma!! p.s. opws katalabaineis se epomeno post mou 8a uparxoun fwtografies apo Thessaloniki! 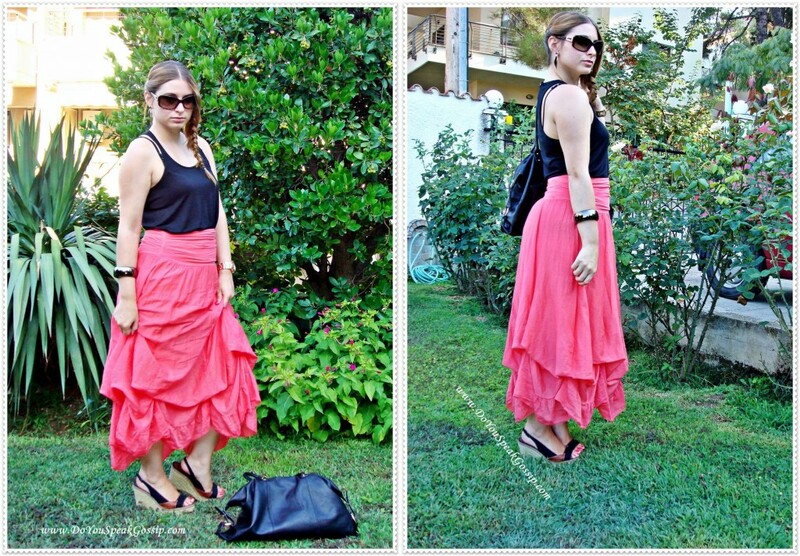 M mou, I told you, lots of coincidences, today I posted something talking about gypsy style! Not quite as nice as yours, you always look fabulous! Aaaalways! I was surprised to see your braid again, and I have to say congratulations!, cause as much I as love braids (and side braids particularly, I wear them sometimes), I told you, I would never be able to do that!!! Yes, that is a work of art! Congratulations again! I love your watch and your skirt, it’s a beautiful color! And as I said before, ah, what for beautiful nails and nail polish! You look really beautiful! But you know this! Thank you so much for your lovely comment Denise mou! 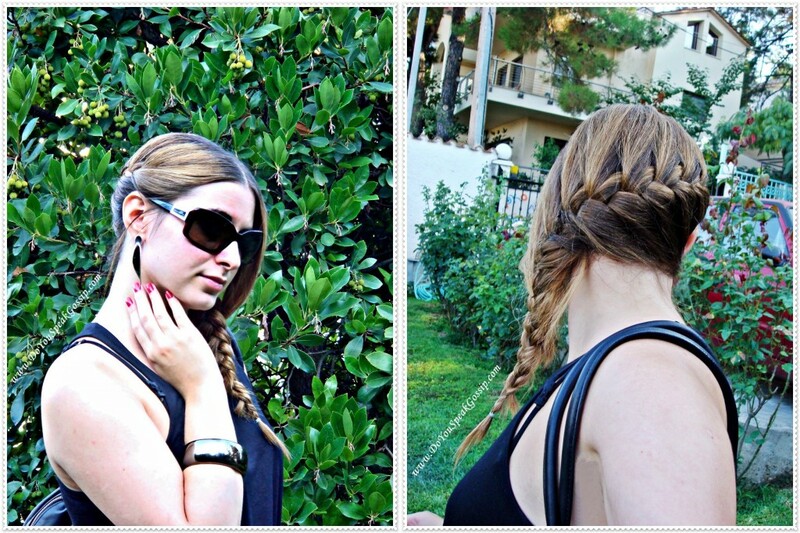 As I said in the begining of this post, unfortunately, I didn’t do the braid myself. The pics are older than a week’s when I still had this hairstyle (made by my hairdresser). I wish I could do it all by myself, but I’m afraid I’m not good at this. I can’t even keep my hands up too long so I can finish it. Glad you like my outfits and my nails so much! 🙂 You always make me smile with your comments. such a gorgeous skirt! Your hair looks great! Did you do it this time by yourself? I like messy braids best! Hey Sara, thank you for your comment! Glad you liked it! Your skirt is so fabulous and they look amazing on You. Braid is so adorable hairstyle. So wonderful photoshot location. In good way I envy you on your fantastic MK accessory, it looks gorgeous. Well done pretty lady! 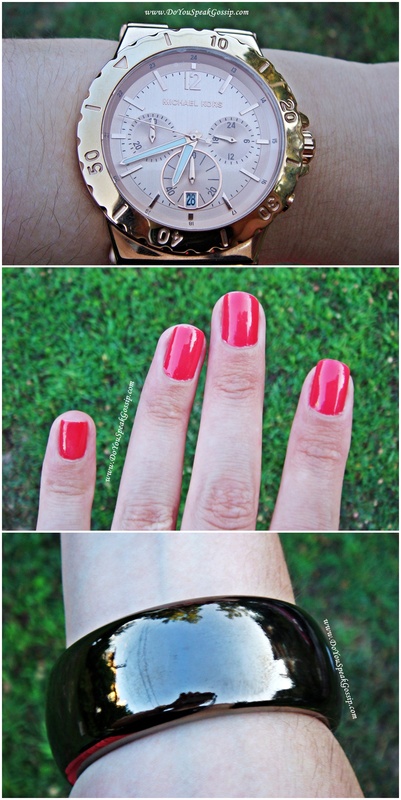 I really love my MK watch too! La jupe est chic! Superbe couleur! I LOVE that skirt! The color and cut are amazing! And your hair looks so beautiful! I always wish I could create that look with my hair – I’m not talented enough to do it on my own! Thank you so much Jilly! Glad you liked it! Oh how I wish that too! Unfortunately I had the hairdresser make the braid. I’m not talented either! You look gorgeous! 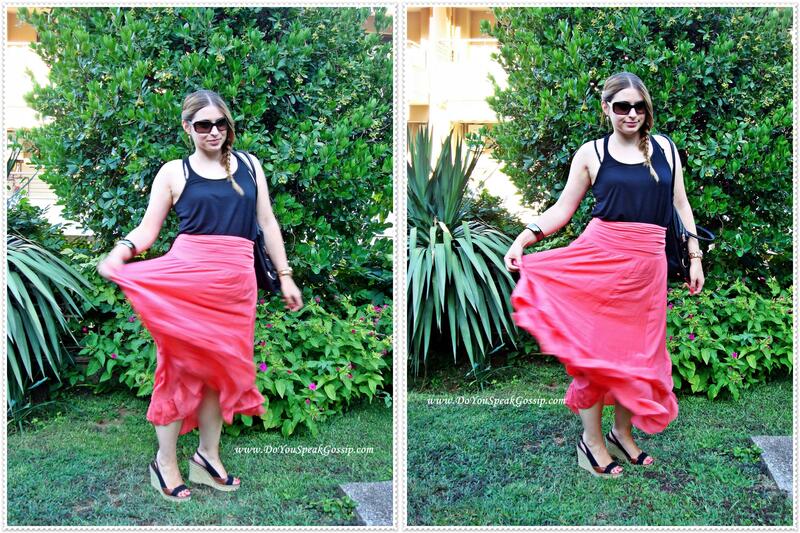 I adore this coral skirt – so beautiful!! I just became your newest follower! I would love for you to visit our blog & follow us back if you’d like. Thank you so much for your lovely comment and for following me kat! I’ll visit your blog as soon as possible. Gorgeous Gypsy! Coral definitely suits you perfectly, I adore your hair here, and oh my! do you know how much I’ve been wanting a MK watch? love it! Happy weekend! Oh I’ve been wanting a rose gold watch for over year. I’m so glad I found this beautiful Micheal Kors one. your look is really nice!!!!!! Thank you Julia! I’ll visit your blog too, as soon as possible. Claire recently posted..Lovely blog award! πολυ πολυ ομορφη φουστα σου παει παρα πολυ κ το χρωμα κ με το μαυρο απο πανω! caramellitsa recently posted..Deco Ideas for a Dreamy Bedroom…Ιδεες διακοσμησης για το δωματιο σας..
Euxaristw poli gia ta glika sou logia caramellitsa! 🙂 Xairomai pou sou aresan! I really love this outfit! 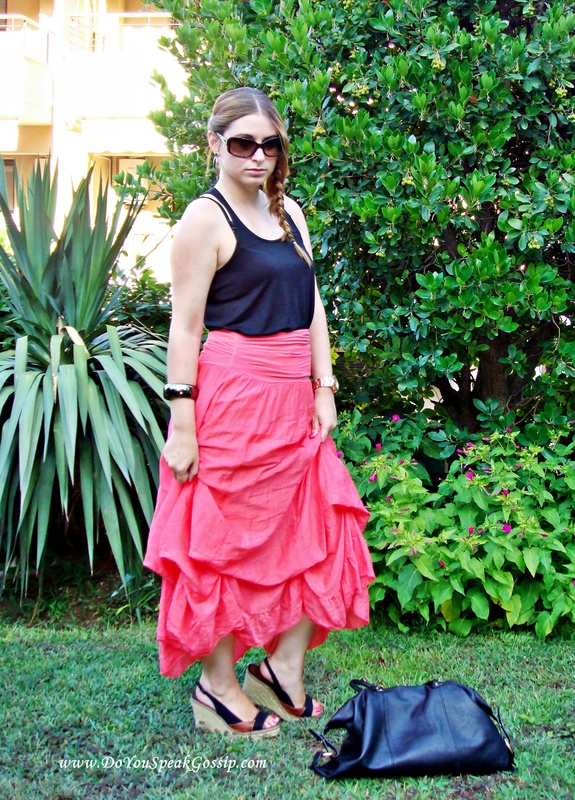 The long skirt is really nice and it totally matches with the top, wedges and your nails. And the color is also beautiful! Thank you very much Kristal! Sou paei poly auto to boem stylaki, den to sizitw! Kai i pleksouda, tres chic. haha nai ase kai egw to idio eixa pathei me to roloi kai eidika me to xrwma tou! what a fun skirt! and pretty hairstyle too. epestrepsa ellada gia mia evdomada k xairomai toso gia to zesto kairo!epitelous!! ps)i plexouda mia xara kratithike nomizw k tin epomeni mera!oi dikes mu dialyontai!